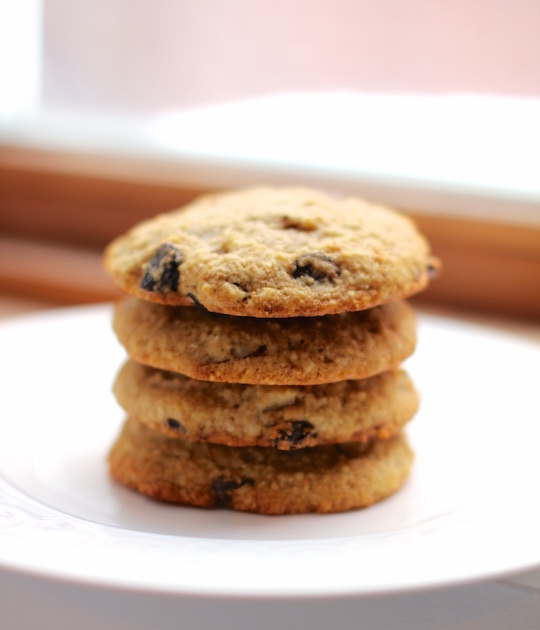 Hey, Lady Grey: Healthy Toddler Cookies! It's the middle of February in Montreal, and we have a new baby in the house. So essentially, we are pretty much house-bound these days. And we're suffering from some serious cabin-fever. Zachary especially.... He's a rambunctious 2 year old with a very tangible need to burn off excess physical energy. And running up and down our (thankfully) long hallway for hours on end isn't exactly cutting it anymore. We scoured the internet for suitable recipes and inspiration, but we couldn't find anything that suited our needs. 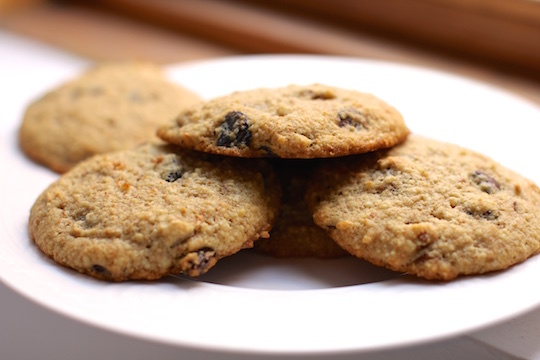 We used to make these 2-ingredient cookies all the time, but after a while they just weren't satisfying enough... they were, dare I say, a little too healthy for our tastes. 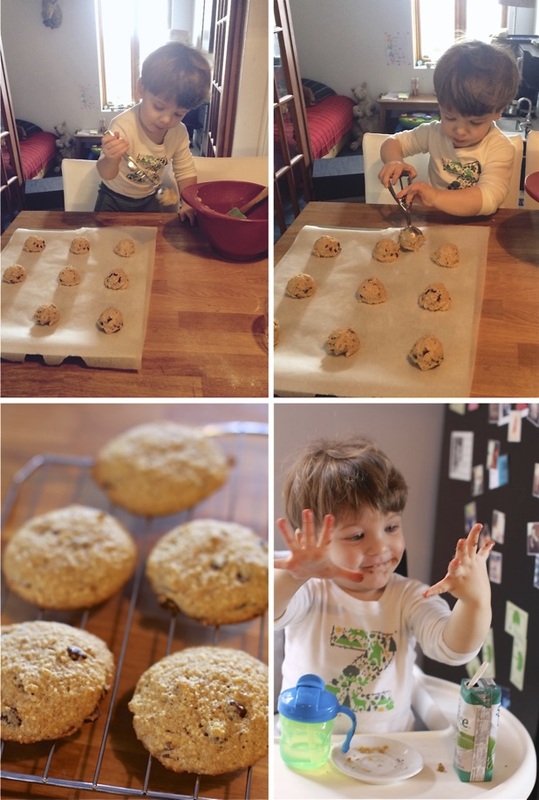 I wanted our cookies to still taste like a treat - yet be full of protein, healthy fats, and complex carbohydrates.... you know, a well-balanced toddler snack that is fun to eat too. Is that too much to ask for? And the result was rather delicious actually! The entire batch lasted less than 24 hours in this house... they were that good. (Also a clear indicator that we are house-bound and bored out of our minds and just stuffing our faces with cookies to pass the time!). 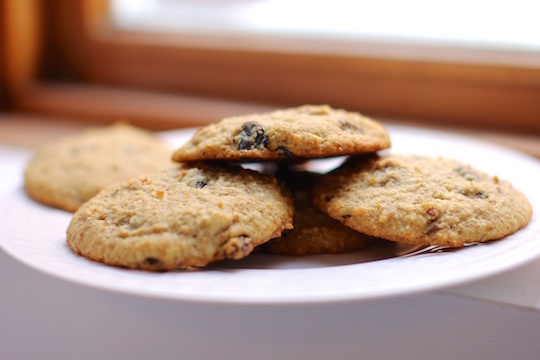 No but seriously, these cookies are fantastic, and we will definitely be making them again and again. ^^ my little sous-chef! For the record, Zac did not scoop out all those perfectly placed cookies by himself, but he did try! In a large bowl, whisk together the mashed banana, egg, melted coconut oil, maple syrup, brown sugar & vanilla. In another bowl, combine the almond meal, flour, salt & baking soda. (a tsp of cinnamon would also go wonderfully, if so inclined). Mix the wet & dry ingredients together. Then add in the pecans, raisins & chocolate chips. Refrigerate dough for at least 30 minutes. Using an ice cream scoop, scoop spoonfuls of dough onto the baking sheet, leaving about 2 inches of space between the cookies (no need to flatten them out). Bake for 15 minutes, until edges are golden brown. 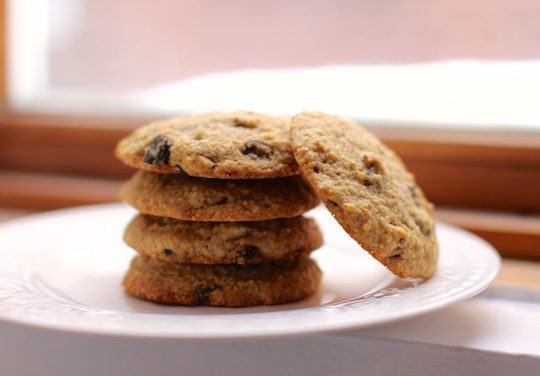 Allow the cookies to cool for 10 minutes on their baking tray, then transfer to a wire rack to cool completely. Serve to your toddler and enjoy them yourself too! I probably shouldn't have clicked on here during my whole30. I might be drooling a little. I can't WAIT to bake a batch of cookies when this is over. haha These look good. I would maybe switch raisins for cranberry for my own because i'm not a huge raisin fan! Hey Catherine, that's very strange that they didn't flatten... I have no idea why and find that very odd! We're planning on making another batch tomorrow so I'll let you know if I figure out what the problem might be. I am cursed when it comes to cookies, they never flatten! But with these, even as cakey little balls, they disappeared in 2 days! As soon as my bananas ripen I'll try them again.